I haven’t really finished being over the whole Thanksgiving thing, I mean, I am still buying a lot of cranberries?? Why?? I just love cranberry sauce and I will keep making it until I am tired of eating it which should be really soon….but until then I am baking Cranberry Applesauce Bread and because I don’t have enough applesauce for my recipe, I am adding….drumroll…you guessed it…cranberry sauce! Just a bit , for color, for fun, for fun flavor! A bread this moist deserves a medal, an award, a speech. I do declare this bread to be the winner of cranberry breads, said in my most royal of royal voices, eaten with my most royal of royal teas, why Earl Grey I declare! Okay, now you know I am not British, but this bread is delicious. 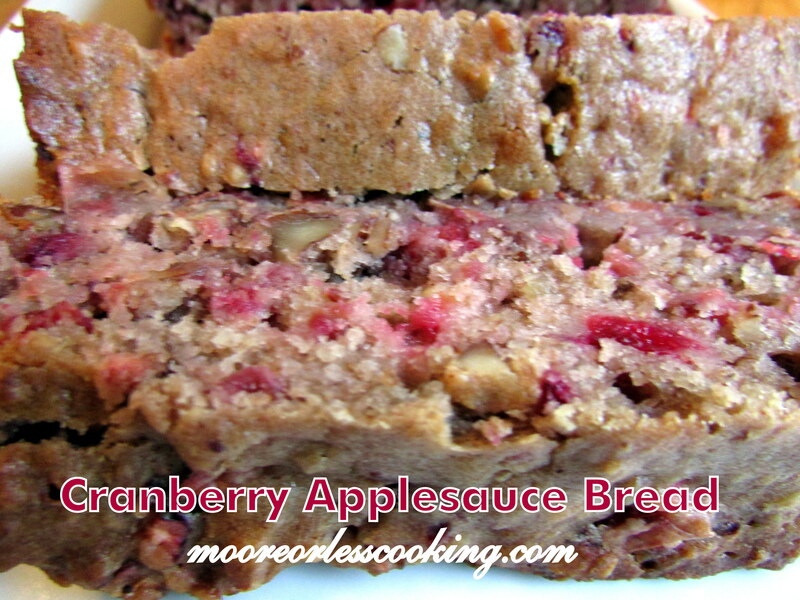 It’s an easy quick bread that is great for when you are having tea parties or just want a loaf of yummy Cranberry bread! Preheat the oven to 350 degrees F. In a small bowl, toss the cranberries with the 1 tablespoon sugar and set aside. In a large bowl, cream the butter and remaining 2/3 cup sugar. Beat in the egg and vanilla. In another bowl, stir together the flour, baking powder, baking soda, cinnamon, salt, and nutmeg. In a separate bowl, combine the applesauce, cranberry sauce and milk. Add the flour mixture and the applesauce mixture alternately to the creamed mixture. Beat well. Stir in the cranberries and walnuts. Pour into 1 large or 2 small greased loaf pans. Bake for 50 minutes, or until a toothpick inserted in the center comes out clean. Remove to a wire rack and let cool before slicing. I have a ton of cranberries in my freezer! Thank you for giving me a reason to use them! You can use either homemade or in a can. I had some leftover homemade cranberry sauce that I used for this recipe. thanks for replying back . You don’t mention when you add the canned cranberry? Add it with the applesauce.I will fix that, thank you!